Again, I give C. S. Lewis the highest marks for technical merit. The material he dealt with in this book was much more dense than any of his other classic pieces that I have had the pleasure to read. As a result, I give him 4.5 out of 5 stars for clarity and creativity in prose. My edition was 161 pages long. Like A Grief Observed, the pages had wide margins that are great for note taking. The Problem of Pain is the flip-side of A Grief Observed. Namely, Problem of Pain tries to take a cold, analytical approach to the question that Grief Observed tries to engage with on a more emotional level. Over and again, Lewis reminds the reader of his approach, so as to avoid offense at his seemingly cold-hearted statements. However, he must be cold and unattached in order to answer the question properly. The main question dealt with in this book is, How can a loving God allow his creation to live in a world of pain? This topic is one of the greatest objections to Christianity, and he certainly takes it very seriously. While speaking of the goodness of God, Lewis makes sure to emphasize the fact that God is completely distinct from his creation, though fully invested in it. With this statement, Lewis lays the foundation for the goodness of God apart from creation. In order for God to be God, he must be apart from his creation. Therefore, since he is apart from creation, it is possible for a good creation to go corrupt, which is exactly what happened, according to Traditional Orthodox Christianity. True love seeks the best for their object of love. And God created us to be the objects of his love. He will do whatever it takes to get us to receive that love, even cause us to endure pain. In the chapter referring to the fall of man, Lewis posits an interesting theory for what the Origins and Fall stories mean. He certainly endorses a Mythopoetic reading of the passage where man's consciousness eventually develops into the state of reason, which is when God breathes life into him. At that point, man uses his newfound consciousness to inflate his hubris and sever his relationship with the creator. 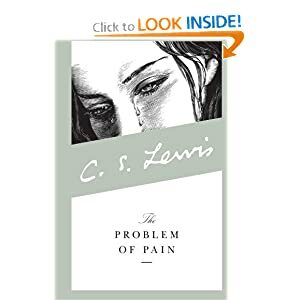 Finally, Lewis includes speculative chapters on Heaven, Hell and Animal Pain. Each are quite interesting. The most important point when considering these chapters is the fact that little is explicitly told to us in scripture on these subjects. Therefore, we do not need to be consumed by these topics. If they were critical, we would have been given more information. Regarding animals, we have no information in scripture at all. The absence of evidence is not necessarily evidence of absence, however. Hence, we can make no conclusive statements about the nature of animal experience. Scripture was written to humans for humans, we are not given any more details about nature.